Frank Ricci at the podium. Craig Fishbein is at far left; David Osborne at far right. The firefighters’ local led by Ricci, who was the lead plaintiff in a federal reverse-discrimination lawsuit that produced a landmark U.S. Supreme Court opinion in 2009, accuses the statewide affiliate in a Superior Court lawsuit of misusing union dues and aggressively trying to collect back dues, despite the local’s vote to disassociate from the statewide organization two years ago. Ricci said the statewide union misused at least $96,000 in dues paid by his firefighters and then hired a collection agency, Recovery Solutions Group, to pursue $52,000 in unpaid dues, an unsual move that Ricci called harassment. He likened the firefighters’ statewide leadership to scam artists. A twist in the case is the presence of the Pennsylvania-based Fairness Center, which describes itself as a “nonprofit public interest law firm offering free legal services to those hurt by public employee union officials.” It has sued public-sector unions on behalf of disgruntled members, but has never represented one in court — until now. The allegation of $96,000 in misappropriations stem from Local 825’s views that its dues were used for other than lobbying at the State Capitol. The suit comes at a propitious moment for conservatives in the fight to limit the political influence of public sector unions by attacking their ability to mandate the payment of dues from members and so-called “agency fees” from non-union workers whose wages and benefits are set by union-negotiated contracts. 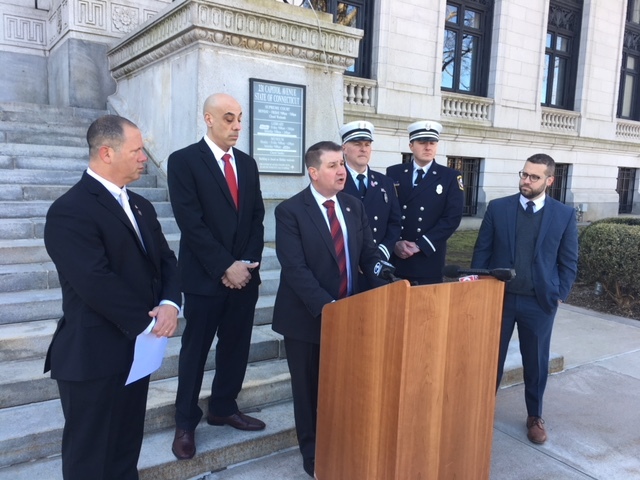 Ricci said Local 825’s lawsuit is aimed at the Connecticut firefighters’ union and its president, Peter S. Carozza Jr., not the broader public-sector labor movement. “Why Frank has decided to go outside and make partners wth people who want to see people like Frank and his members not have a union, not have benefits, is befuddling to me,” Pelletier said. Ricci was elected president of Local 825 in December 2015. He was one of 18 firefighters who successfully sued New Haven over the city’s decision to set aside a promotion test after no black firefighters qualified for promotion. More recently, Ricci broke with the AFL-CIO and the Uniformed Professional Fire Fighters by opposing a bill last year that would have expanded worker’s compensation coverage to include post-traumatic stress suffered by police and firefighters.